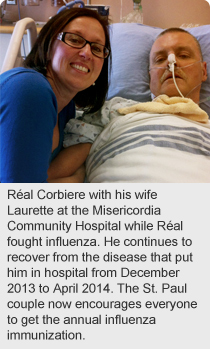 Réal Corbiere has faced a few battles in his life. More specifically, he has faced a few battles for his life. A survivor of cancer and three heart attacks, Réal thought he had experienced the worst of health challenges — that is, until his months-long fight with influenza last year. The 54-year-old St. Paul man, who didn’t get his influenza immunization in fall 2013, contracted H1N1 influenza last December. His health quickly deteriorated and he was admitted to the intensive care unit (ICU) at the Misericordia Community Hospital in Edmonton on Dec. 29. While in the ICU, Réal spent 14 days in an induced coma, in isolation, battling a secondary infection of pneumonia. Subsequently, his kidneys shut down and his heart beat erratically. His wife, Laurette, and the couple’s three children, Gabriel, 21, Miguel, 18, and Chloe, 14, watched and prayed he would recover. Réal could move only his eyes and mouth when he came out of the coma in mid-January. Discharged from the ICU in late February, Réal was moved to an acute care unit and then, in mid-March, to the Glenrose Rehabilitation Hospital to begin his recovery, including learning to walk again. Almost a year later, Réal is still struggling with a low energy level and doesn’t have much feeling below his knees, affecting his balance. “He just doesn’t have the stamina that he used to have. It’s hard to keep up with his daily schedule and when he does, he’s tired at the end of the day,” says Laurette. Influenza also affected Réal’s hearing and eyesight, and his teeth are still damaged from biting on the breathing tube that helped keep him alive while in hospital. Réal also missed out on important family events, including Miguel’s departure to college in Fairview. A long road of doctor’s appointments and therapy sessions remain ahead of Réal in his journey to regain his life. Laurette says she and Réal got their influenza immunization in previous years but didn’t in 2013, as they didn’t believe they could get seriously ill from influenza. This year, the couple were first in line for their influenza immunizations and they encourage friends, families and acquaintances to get their flu shots. “I travel with my business a lot and the first thing I do when I meet people is tell them to get their flu shot as soon as they can,” says Réal. Visit the Alberta Health Services influenza webpage for more information about influenza to the find an influenza immunization clinic near you.